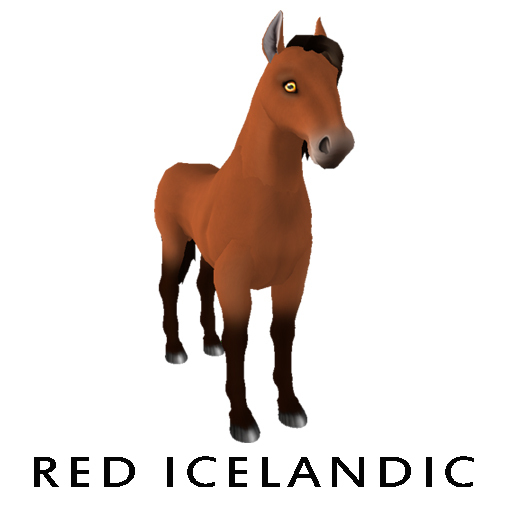 Today, I want to remind you all about the Appreciation Eyes available for the Horses and K-9s. 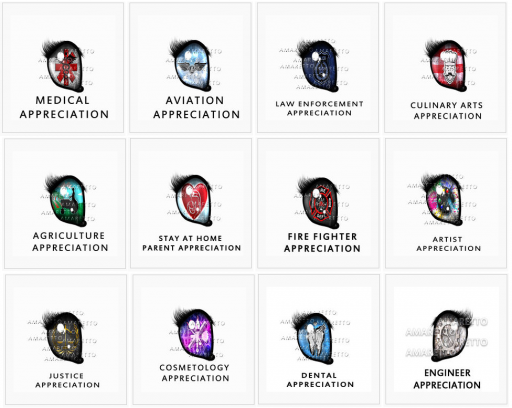 These eyes cover a broad spectrum of professions. 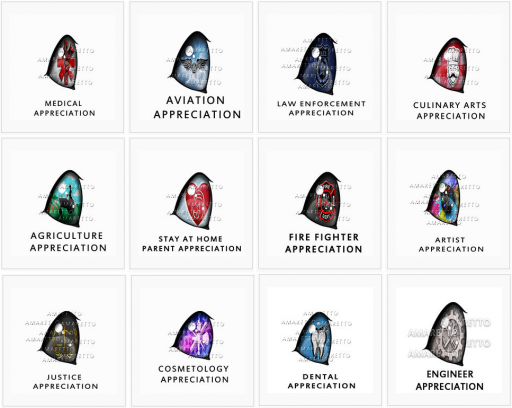 From March 1, 2014 through February 28, 2015, each Horse and each K-9 breeding had the chance of getting an Appreciation Eye. There was a different eye randomly dropped each month. These eyes CAN be passed on and there are so many possibilities for using them in your projects. While these eyes promoted appreciation for something new each month, Amaretto appreciates YOU, the breeder, every day of every year! Hey guys its Ava! I hope everyone is enjoyig this Terrific Tuesday! 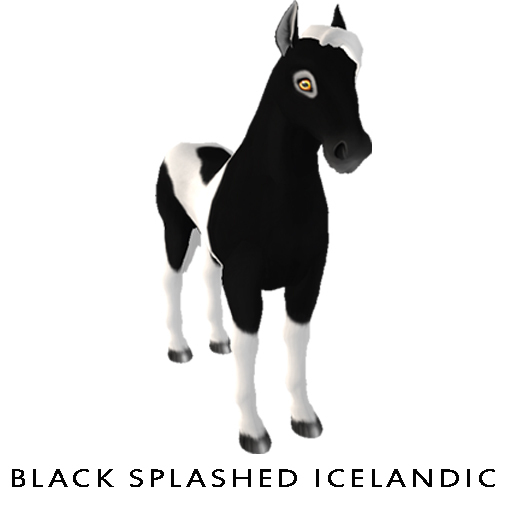 So with all the craziness that has been in sl the past couple of days I wanted to talk to you about sick Horses, K-9s, Barnyard Birds, and Ponies! 1. Are scripts turned on? 2. Is the food set to All, Owner Only, or Group? 3. 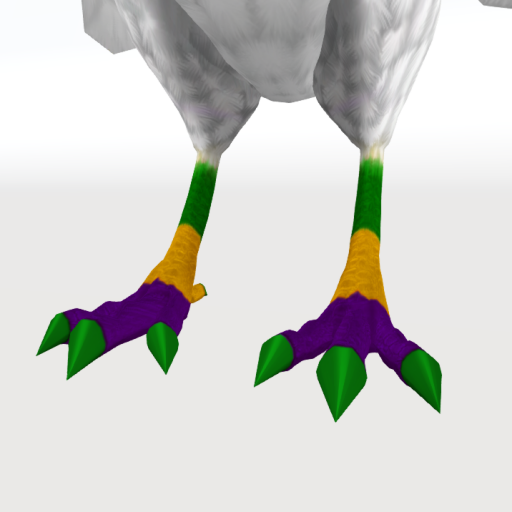 Is the breedable set to to correct food breedable or pet? 4 Is the food within range? 5. 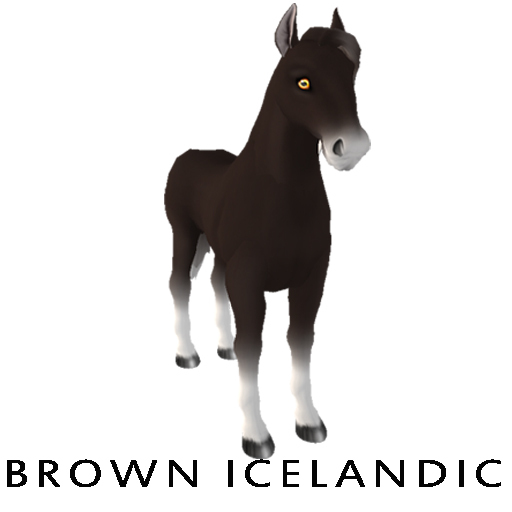 Is my breedable frozen or duplicated? 7. Did i rerezz the breedable? 8. 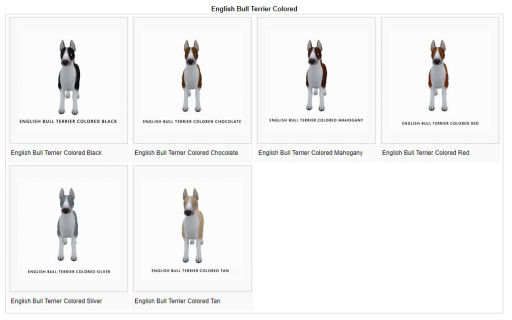 Is my breedable up to date? If you go thru all these questions and still can not figure out why your breedable is not eating you should go ahead and file a ticket to have a csr come out. I cant tell you how many times ive went to a breeders and its a simple setting that is keeping their breedable from eating! It can happen even to the seasoned breeder! 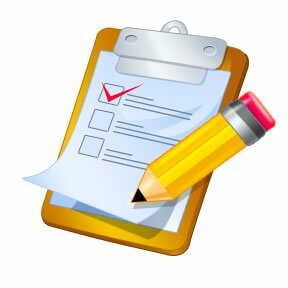 If your breedable is sick currently it will take 3 days for them to eat thier way out of sickness, unless you are talking about ponies, ponies must have ponie noodle soup once they have this poine is sick above their head! So happy breeding and eating everyone! This is Ava over and out! Hey everyone! Happy Monday! I hope you all had an amazing weekend! 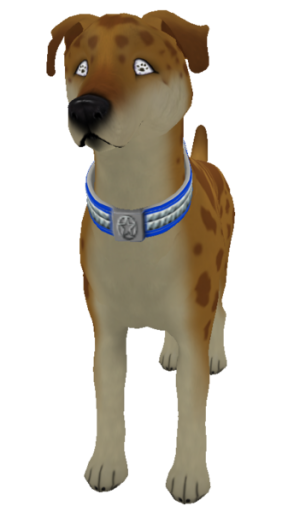 Today I want to talk to you about some awesome K9s… the Blanco and Mutt K9s!! The Blanco’s are K-9s that come from breeding two K-9s of the same color coats together. For example, breeding two Tan Tri-Color Beagles together could produce a Blanco Beagle. 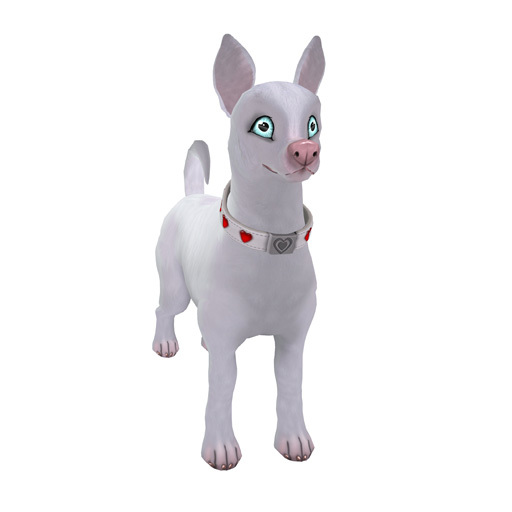 The coats on the Blanco K-9s do NOT have the ability to be passed on. The Blanco collars DO have the ability to be passed on. The Mutts are what you have a chance of getting when you breed two FULL siblings together. In order to be FULL Siblings both K-9s must have the same mother and father. Now even though the Mutt coat DOES NOT have the ability to be passed on, the Mutt eyes DO have the ability to be passed on. Happy Blanco and Mutt breeding! 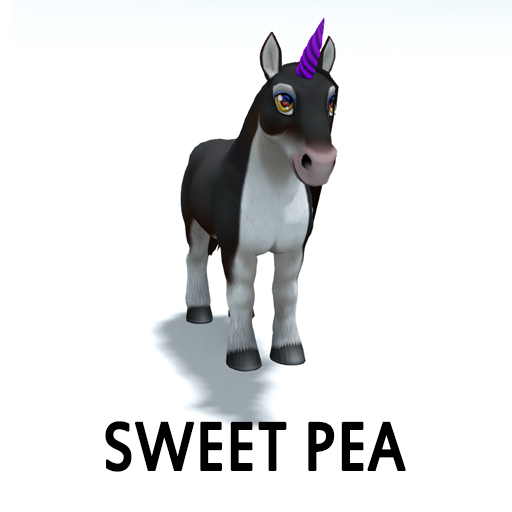 With those pretty Mardi Gras LE’s, SE’s, CE’s and DE’s going off sale recently I wanted to touch on another special Mardi Gras animal in the Ponie Pals! Amaretto released the first Ponie Oasis Ponie on September 19,2017. 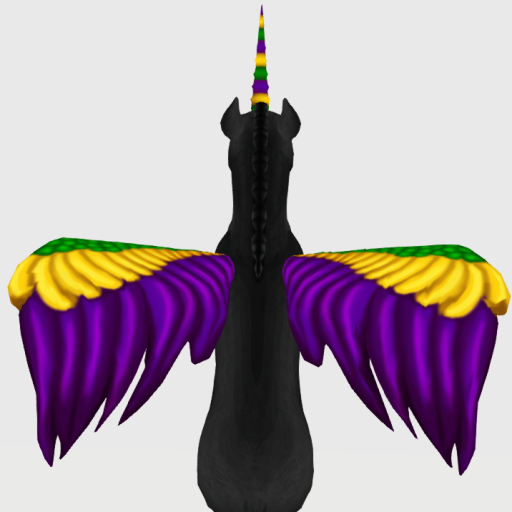 You can get your very own Amaretto Oasis Ponie – Mardi Gras by purchasing them at any Ponie Oasis Vendor! As an added surprise if you breed your Amaretto Oasis Ponie – Mardi Gras with a Masquerade in Lemon, Gold Bandit, or Yellowie Fabulous you have a chance at getting a Gold Wing! Amaretto Oasis Ponie – Mardi Gras males have a higher chance at getting you a Golden Wing. 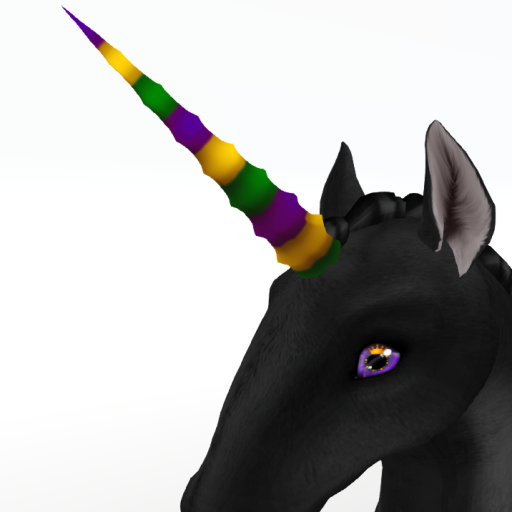 Amaretto Oasis Ponie – Mardi Gras are NOT able to pass their style. 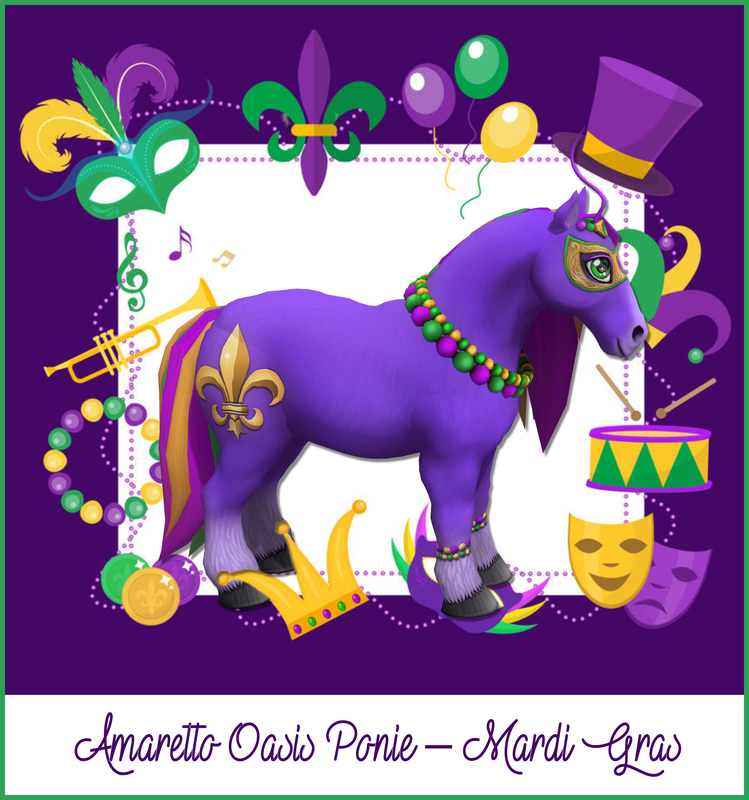 Amaretto Oasis Ponie – Mardi Gras DO have the ability to pass their eye. It’s so cute and worth saving up your Oasis points for! Thats all from me today, until next time happy breeding. 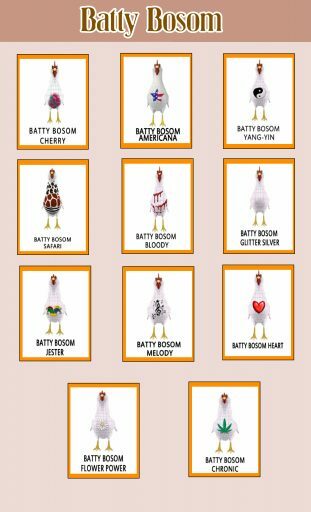 Today I want to spotlight another of our barnyard bird traits – the Batty Bosom!! The Batty Bosom was introduced to breeders on June 1, 2016 and replaced the Crazed Barnyard Birds!! Each month Amaretto announced what we would need to breed to get that months Batty Bosom! 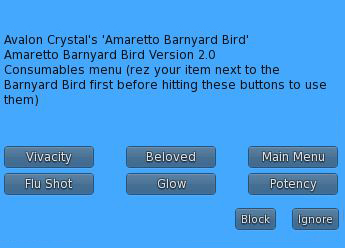 We had to breed two Barnyard Birds with the announced trait for that particular month and it was a lot of fun!! Here are the results of the monthly Batty Bosom trait! Until next time this is Snookie saying bok bok and happy breeding!! More 2018 Mardi Gras Surprises! Howdy yall! I hope you are having an amazing Friday! 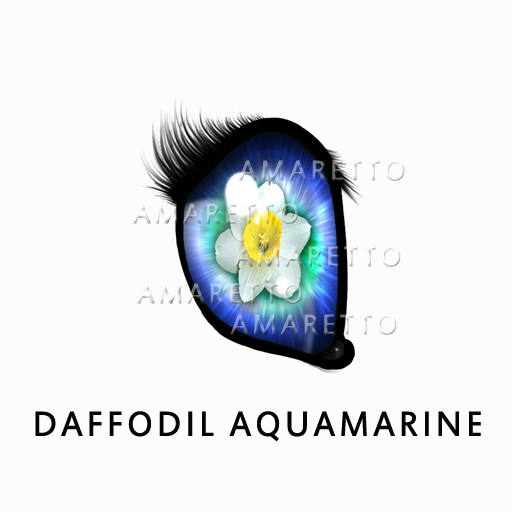 I wanted to take a moment to show you some surprises that came from the 2018 Mardi Gras Krewe of Amaretto Editions! Take a look below at the awesomeness! And remember that these surprises do have the ability to pass! 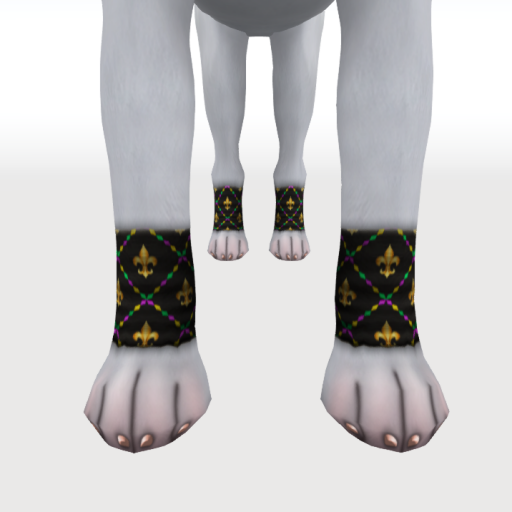 You can get these surprises from any breeding of the 2018 Mardi Gras Krewe of Amaretto king and Queen! Happy breeding yall! Until next time…. Hey guys I hope you are all having a great day! It a terrific Thursday here at the ranch! I know all you guys are waiting and some even holding your breath. So with that being said let me announce what the breeders for the special drops for the month of March is! 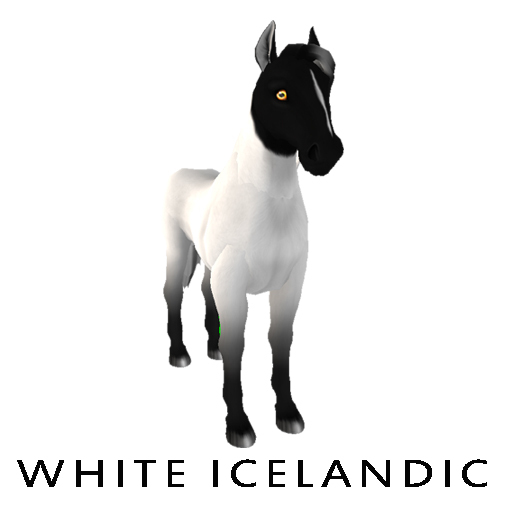 Let’s start with our awesome horses, from March 1st thru March 31st when you breed any horse with a Daffodil Aquamarine Eye to any color Icelandic you will have the chance at a Daffodil Aquamarine Icelandic! This beautiful coat DOES NOT have the ability to pass, but the all new eye DOES. Now on to the K-9s. 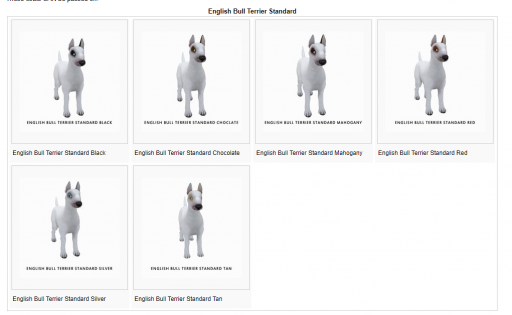 From March 1st thru March 31st when you breed any K-9 with the Pisces Aquamarine Eye with ANY color English Bull Terrier you will have a chance at getting the new Pisces Aquamarine English Bull Terrier! The coat DOES NOT have the ability to pass, but the all new eye and collar DOES. 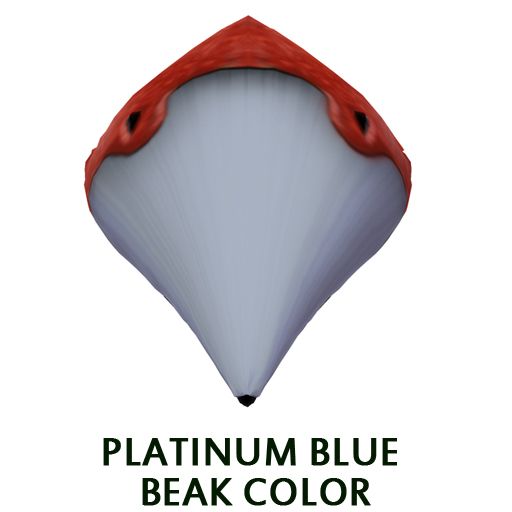 Last but never least brings us to the Barnyard Birds, starting March 1st thru March 31st breed any two birds with the Platinum Blue Beak have a chance at the new March Aquamarine Bird! 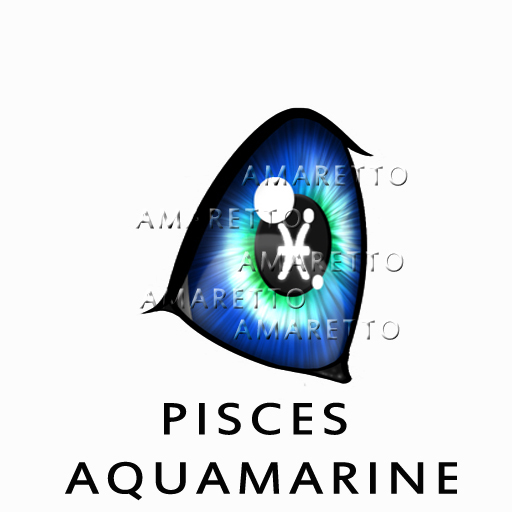 This breed DOES NOT have the ability to pass, but the all new eye DOES. So now everyone can breathe a sigh of relief! Happy Breeding Everyone! Today, I want to showcase an awesome K-9 collection. The Mutt! Sometimes when you breed particular K-9s together, they can make some magic and drop some pretty awesome kennels. By breeding FULL siblings together you have a chance at getting a Mutt. In order to be FULL Siblings both K-9s must have the same mother and father. The Mutt coat DOES NOT have the ability to be passed on. Mutts even have their own special eye! 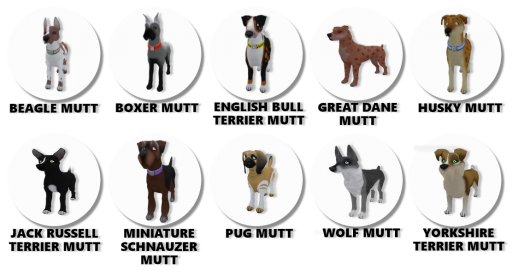 You can have a chance at one of these exciting Non-Starter Mutt eyes by breeding any Mutt with another K-9 or by breeding together two Mutts. Don’t delay, start breeding those K-9 siblings today! Hey everyone hope you are having a terrific Tuesday! I wanted to take a moment to show you some super sweet horns that came from the 2018 Mardi Gras Krewe of Amaretto Ponies! 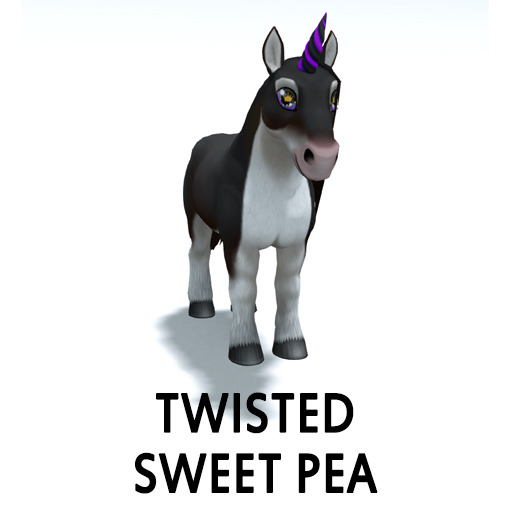 If you already got you 2018 Mardi Gras Krewe of Amaretto Ponies and you are curious to see the sweet surprises I am glad to introduce to you horn Sweet Pea and horn Twisted Sweet Pea! Remember that these horns do have the ability to pass! Thats right you can get these 2 brand new horns from any breeding of the 2018 Mardi Gras Krewe of Amaretto king and Queen! I could think of a few different projects i would use this horn for! I can’t wait to see what you guys do with this one! Keep your eyes out for other Mardi Gra Surprises because they are on their way! Happy breeding everyone this is Ava over and out! We established this button for 3rd party products. It sends the API to their 3rd party products over a certain channel. 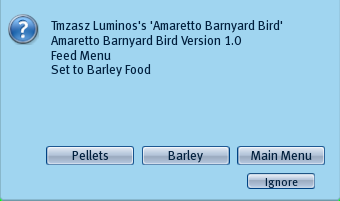 This button is for use with the Amaretto Updater. 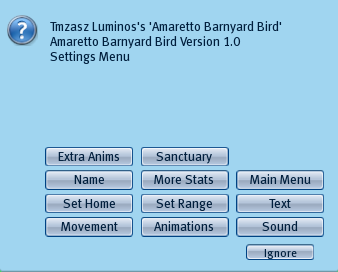 When an update is issued, you will rez the updater next to the Barnyard Bird, click the Barnyard Bird, click the update button and the Barnyard Bird will update to the correct version. This button is used to wake up the Barnyard Bird. 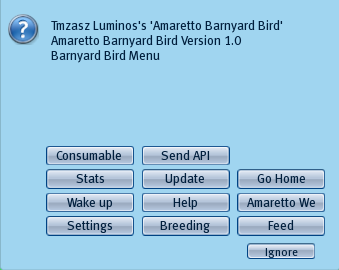 Your Barnyard Bird must be at 25% energy in order to wake up. 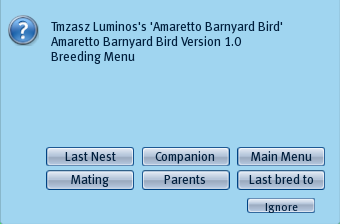 I hope this helps make breeding these wonderful feathered friends a lot easier and enjoyable!!! Until next time…..